So much has changed since my last post 2 years go. Too much to write here, but enough material for a book perhaps in the future. I changed a few words to describe my ‘blog’ as I am interested in so many things. So expect more than just sewing. But lets start with sewing. This time its costume. Cake Daddy Costume. October 2018. I get a call asking to create 3 costumes for a show. Meetings commence, monies discussed, and measurements taken. I meet Ross Anderson-Doherty, the star of the show. He happens to live just around the corner from me, and I like him instantly. I have to be honest, if I get a good vibe from someone, and a mutual respect of each other, then I will add extra costume magic when creating their costumes. This is how I felt about creating Ross’s costumes. The costume design was by Leho De Sosa, a visual artist and activist from Uruguay. I loved his sketches. We communicated by mail and I was delighted to make his sketches a reality. Here are Leho’s designs, flamboyant, fun and bursting with colour! Cucumber Rockets realised on stage. Cucumber Leisure Suit realised in cloth. The costume sketches are all created by Leho De Sosa. All photographic images above are taken by Bernie McAllister / Argyll Images, and are used with her kind permission. 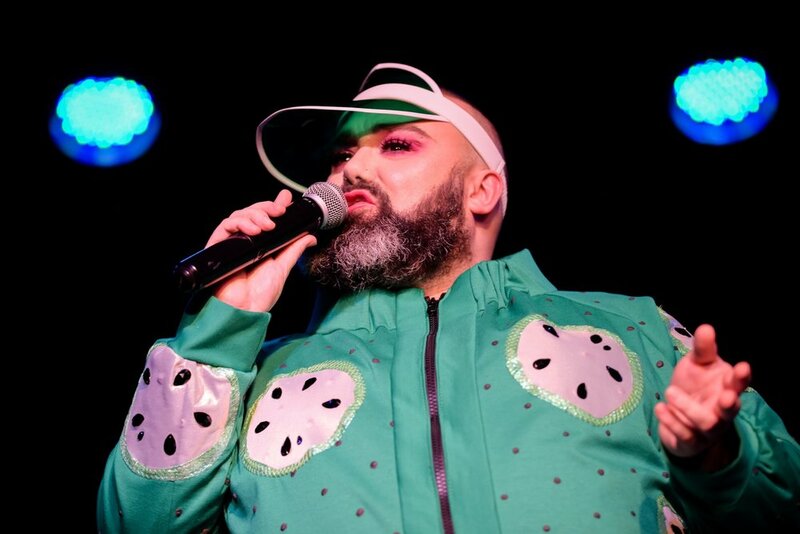 Cake Daddy was the opening show for the 2018 Outburst Queer Arts Festival. The venue was the Black Box, Hill Street, Belfast. The photographs are from the Opening Show night. Below are the costumes in more detail. From starting life in my studio in Belfast, the process of hand making, dyeing, spraying, fitting. Each costume element was made from scratch. I created custom made patterns for all these designs. The only costume elements that were bought in were the 2 pairs of boots and the visor. The fabric and materials were sourced locally for all designs. CUCUMBER SHIRT : Main fabric 100% cotton from Mad about Fabrics. It was then dyed, bleached, sprayed to get the desired effect. CUCUMBER LEISURE SUIT: Green stretch fabric from Paragon Fabrics. Cucumber fabrics all from Paragon Fabrics. Cucumber rockets ready for take off! The second half, when Cake Watchers becomes Cake Daddy! Below are the costumes in more detail. The fabric and materials were sourced locally for all designs. Each element for the C.D design was machine stitched. PINK APRON : Main fabric from The Spinning Wheel. C.D. design fabrics from Paragon Fabrics. PINK SHOWPIECE BLOUSE: Fabric from Craftswoman Fabrics. 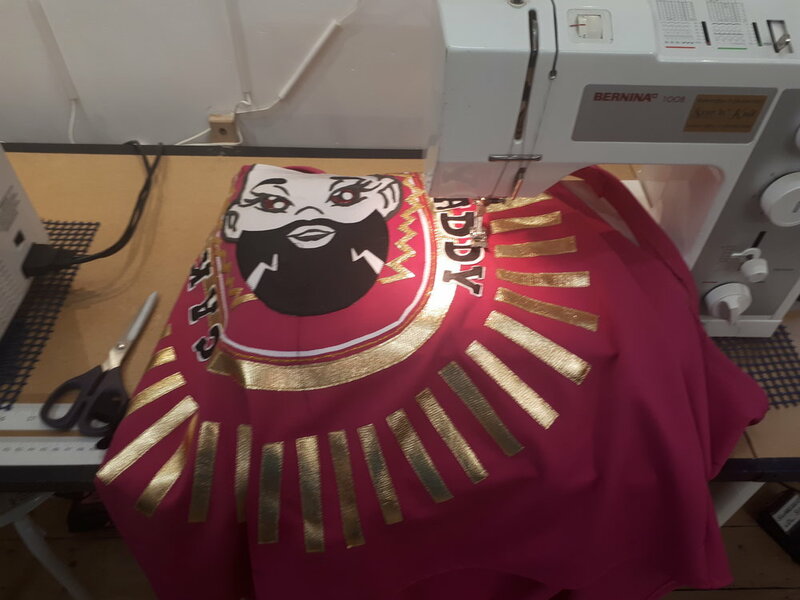 Cherry buttons on the gold collar. Small details make the difference. This is where the magic happens! My studio in my 3 up / 3 down terrace in South East Belfast. I love the freedom to spread out and just CREATE! 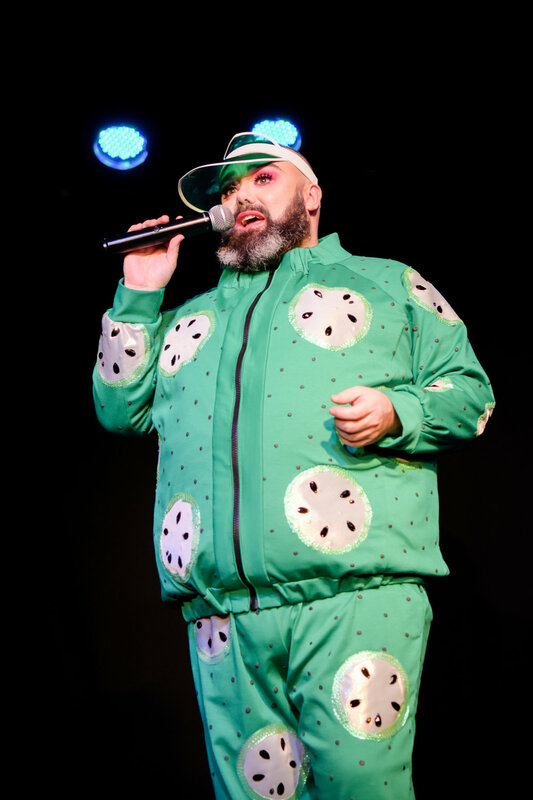 After 2 sell out shows in the Black Box in Belfast, The Cake Daddy Show went on tour to Melbourne. Playing at the Theatre Works, Melbourne, The Seymour Centre, Sydney and on stage at the Sydney Mardi Gras. I am very proud to see my costume creations travel the world. This post is costume specific. Credits and Thanks are in the image below. All creative team have been linked throughout the post. My thank you’s go to Alyson Campbell for appreciating all the hard work that goes in to creating costume and approving my makes. Ross Anderson-Doherty for being such a fabulous gem to costume. Your show stirred me, enlightened me and your performance and singing blew my mind. Your message through CAKE DADDY was unforgettable. Big thanks also to Rachel Moore, University of Ulster, who was my placement student for 6 days. 2 of which she was able to come to fittings, create costume elements and see first hand the crazy, colourful world of costume. Thank you for reading. Share the love, post a comment and let me know your thoughts. Today I am reconnecting with my writing. Taking a mid afternoon break to share with you my Wednesday Wardrobe workout. This idea came to me in the wee hours last week. I had seen someone wearing a red dress and it made me think of one I had made for my cousins wedding a few years back.